I'm going to be honest: I generally struggle with gift-giving. I always get super excited, have high expectations, and the best of intentions. And then I fall majorly short. But hey, I DO have the best of intentions, which is why I was excited about this month's blog tour from Sewing by Ti: Gifts to Sew! This blog tour was perfect timing for me, since Mike and I have a baby shower on Saturday! 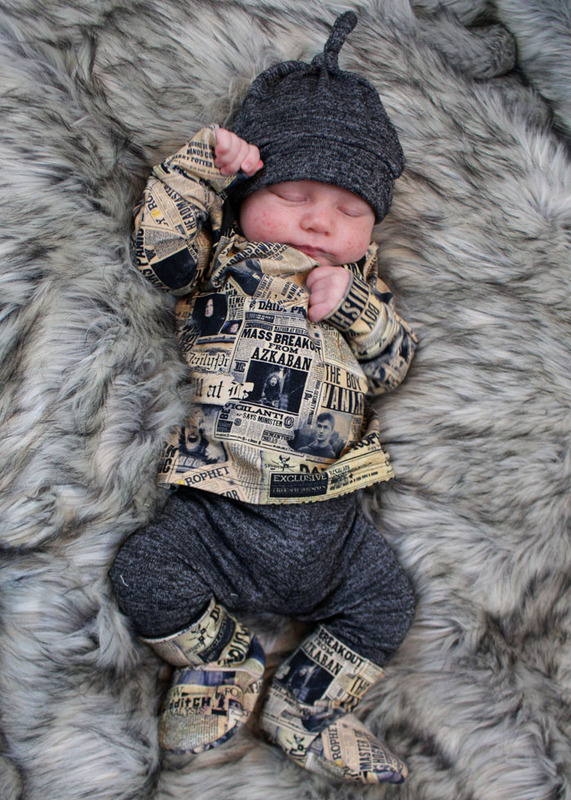 Having just had a baby myself, I was full of ideas of what to sew . . . and having just had a baby myself, I wanted to keep them all for myself. Ha! Oh, and per usual, my high expectations met some roadblocks along the way: two left booties, an elastic mishap, and completely forgetting to include and integral part of the baby nest . . .
All of which made me want to hit up the Target registry. Just kidding (kind of, not really). Once upon a time, I hated sewing baby booties. But then this new pattern, Menta Booties, hit the market a few months ago. I LOVE it. So much easier than the former popular bootie pattern. I've been using it with my scraps for Baby Dane whenever I get the chance. Okay, is this precious, or what?! 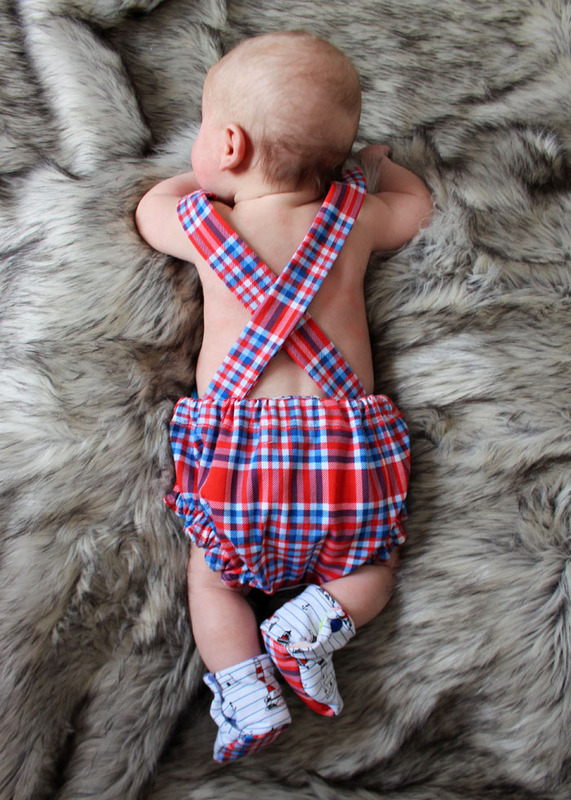 With the baby due in May, this sweet little sew is perfect for summertime. Super cute with or without a onesie underneath. With the right fabrics, I think it would be perfect for baby photos, so I'd definitely consider sewing up the newborn size for a baby gift. This is the Hugo, which is a German pattern (see my post on tips for sewing German patterns!). I picked it up for just 2 euro during a sale. Buuut, if you want an English version, Brindle and Twig has a pattern that looks extremely similar. I can't get over how cute Dane is in this one that I sewed up for him. I cannot wait for him to wear it this summer (fabric is from RP Custom Fabrics). Annnd, you can see his Menta Booties here too! This was the first thing I sewed after Dane was born, and we've used it a ton! It's great for diaper changes, sleeping while traveling, and having a safe space for baby when you have two other boys wreaking havoc on your house. Honestly, I've been surprised how much we use it-- it's great! The pattern is from Peek-a-Boo Patterns. They include some safety instructions with the pattern (like it's not meant for co-sleeping, etc.). Here's a side-by-side of Dane in the nest when I first made it for him (1 week old), and today (almost 12 weeks old). I made the newborn-9 months size. Even though he's obviously getting big in the nest, I still recommend sewing up the smallest size if you're making it for a baby shower gift-- that's the age when it'll get the most use! Those sweet newborns fall asleep constantly and it's great to have a safe space to put them in where ever you are. This is set from Patterns for Pirates has everything you need-- plus the patterns are completely free! Lap band tee, pants, hat, and burp cloth, all ready to go! Really, I wish I would have just sewn this baby up some more clothes-- that baby nest gave me a run for my money; I should just stick to what I'm good at, haha. This is my favorite sleeper (from Stitch Upon a Time). Dane has ten so far. I actually prefer sleepers like this one, with no footies. Why? Because we cloth diaper, so, my babies outgrow the width of the sleepers before the length. So, when we move up sizes, the sleepers are always still to long and the feet flop around. Plus, I love baby shoes and booties, haha. I realized after I compiled this list, that four of these patterns use snaps! I really recommend Kam snaps for reliability and ease of use. I got this starter kit from my mother-in-law for Christmas when I thought I wanted to sew diapers, and it's served me so well. I'm twenty-six weeks pregnant this week, and I've been in full-on maternity-mode sewing lately! There's no denying this bump any more! Even when I'm not pregnant, I sway more towards the fitted side of clothing styles . . . but when I am pregnant, I love fitted clothes even more. Relaxed fit is nice in early pregnancy, but once the second and third trimesters are here, I'm all about showing off that bump! Luckily, it's super easy to take your favorite fitted top or dress pattern and turn it maternity-friendly. These are both the Super Sleeve pattern from George and Ginger (definitely a favorite of mine). You can see the extra side ruching that makes it maternity-friendly. Both of these fabrics are brushed poly spandex. Brushed poly has been my absolute favorite for maternity sewing. It's so soft, comfy, and most of all, stretchy. You won't regret using it for your maternity wear! This blue fabric is from Vintage Lace. Now! Let's get on the the nitty-gritty! Grab your favorite fitted top/dress pattern and 1/4 inch elastic. The only piece you'll be cutting any differently is the front piece-- you can cut all your other pieces the same way as the pattern calls for. I'll give you the numbers I use, but remember that you may need to adapt them to your size/height/baby bump size. First, we determine the length you want your ruching to extend. Hold the pattern piece up to your body, and determine an underbust point, right before your bump really starts. For me, I go with 5 inches. I then also mark 1 inch above that (my 4 inch dot on the pattern piece below). Next, I make a mark under my belly bump (that's the dot by my 3 inch point, as in 3 inches from the hemline [this is a shorter shirt, but I probably still should have done it just a little bit higher]), and then make a second dot 1 inch below that (so, my 2 inch dot). When it comes time to ruche, I'll be stretching the elastic from that 5 inch dot down to that 3 inch dot. The extra inch above and inch below is just extra to get my elastic started, but I don't stretch the elastic at those points. Now, measure the distance between the two furthest dots (for me, between my 4 inch dot and my 2 inch dot). For this top, the measurement was 13.5 inches (so, again, 11.5 inches to stretch, plus the extra inch for the top/bottom to get started/finish off). Pre-stretch your elastic, and then cut two pieces of elastic to this measurement. Now! Time to add the extra length to your front piece. I cut my pattern at that underbust/above-the-belly point (here, 5 inches). I then separate the pattern, and slide the bottom piece down seven inches. The amount you spread is up to you! This is the extra fabric that you'll be ruching, so it's up to you, your body, and where you are in pregnancy. I've done other shirts at five or six inches. I know a friend who usually uses 8 inches at this point. I only add length to my maternity shirts. If you feel like you need more room, you can also consider adding width at this point, and grading the bottom half of the pattern to the next size up. Personally, I feel good about my use of brushed poly, and know this shirt will stretch plenty for me. Cut out your new extra-long front, and transfer the markings on to the pattern. 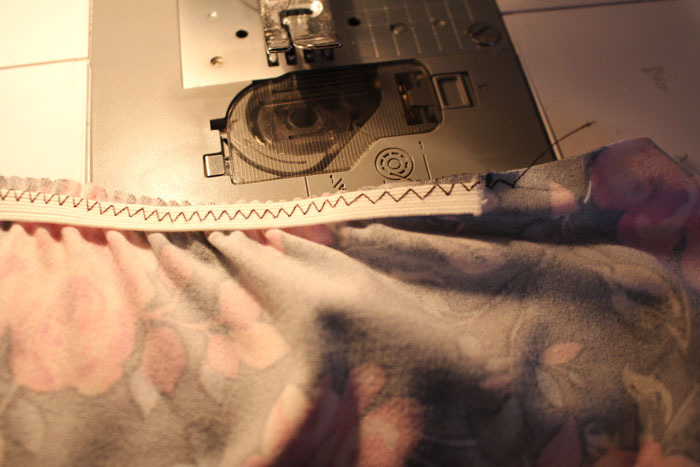 Now head over to your sewing machine, and set it to a zigzag stitch. You're going to be attaching the elastic to the front piece, which will ruche it. At the end, you'll want the elastic to be in your seam allowance when you sew the front to the back. So, for this pattern, I put the elastic close to the raw edge. Put the raw edge of the elastic on that first dot and sew it for that first inch (to the next dot), without stretching it. Once you reach your second dot, you'll begin stretching the elastic. Stretch the length of the elastic down to the third dot (leaving an extra inch of elastic at the end to not have to stretch). You can see here, the last inch was not stretched (the zigzag is bigger, compared to the tighter zigzag when I was stretching). If your measurements were correct, and you stretched the elastic accurately, the side seams of the front and back pieces should match up perfectly! Proceed sewing the pattern as per the directions! I will note that my serger prefers the front piece (the one with the elastic on the bottom). If I sew one side with the elastic up, and one side with the elastic down, the sides won't line up correctly on the one side. Just saying. Every little thing makes a difference! I hope this helps you make your own maternity shirts. Obviously, this isn't a magic set of numbers, but it's an easy way to base it off of your own size and body. After pregnancy, my plan is to cut the side seams apart from the arm pit to the hem, take out the extra length, re-sew the side seams and re-hem. I really can't stand wearing maternity shirts after the baby is born-- it just makes me feel/look still pregnant! But I've been loving what I've been sewing, so they'll definitely be altered into "normal" shirts once the baby is here! Watch out, HTV, I have a new obsession when it comes to my graphic tees! While HTV gives you clean, sharp lines, I love the vintage look of screen printing. There are a few ways to get the job done, but if you have a Silhouette (or other cut machine) you have a fast and easy way to create your own screen printed shirts. This is a great method for a DIY crafter who wants to do super small batches. I could have (should have?) documented the process once I mastered it . . . but I was feeling bold, so I decided to take pictures along the way to show you the FIRST time I tried this method of screen printing. You'll see the shirts aren't perfect, but they're a total success for a first go around. And I will mention that: don't expect perfection the first time! Use a cheap shirt for practice so you can get a feel for it. I've been wanting to try out screen printing for a while now, and for $30 I was able to buy everything I needed (the frame, paint, and squeegee, all of which I bought on Amazon). If you're like me and have been Silhouette-ing for a while now, you probably only need a few extra supplies. I use a Silhouette Cameo 3 and this heat press (optional) for my work. I did two designs-- I Can Make That is a file from my friend Katy over at Thread and Grain, and the Old Fashioned one is my own design (I'm really not sure if people still drink brandy outside of Wisconsin . . . ha!). I used Oracle 651. You cut the design like normal (NO mirroring like you would with HTV). When you weed your design, you will weed out the areas where you want the paint to be (so again, opposite of what you'd be doing if you were HTVing it). Next, apply your transfer tape, the same way you normally would. The squeegee was great for this whole transfer tape process! Next, apply the vinyl to the screen. The vinyl goes on the recessed side of the screen (that is to say, within the frame itself). Again, the squeegee was a lot of help. Go slow. It's tricky to get the vinyl to stay adhered to the screen. I don't do much with vinyl, so I found this step excruciating. If you've done a lot of work with regular vinyl, you'll probably do better than me. Now cover all your extra screen with painters tape. You can get right up onto the wood frame at this step. You don't want your paint to be able to seep through onto the shirt, so make sure you get every bit of space! Alright! We're ready to go! I centered the design on my shirt, and got my squeegee and paint ready. Side note: I've since marked the centers on all sides of my screen, so that it's easier for me to center my vinyl onto the screen, and the screen onto my shirt. I highly recommend it. Pour a line of paint across the top of the design. Using your squeegee, smoothly glide the paint down in an even stroke, making sure to hit all areas of the design. If you have a second people, it's great to have one person hold the frame firmly down. I decided to use my second person to take pictures. Oh well. But really, it's super helpful to have one person hold the frame down. You need more pressure that I did here. But that's part of the learning curve. You'll learn a feel for the squeegee and how much pressure you need. The excess paint on the squeegee can be put back into the container for next time. You'll get a lot of shirts out of this jar of paint! Lift up the frame, and voila! All the pictures in this tutorial are from my FIRST attempt at the process. I've cleaned up since then and worked out my technique and have learned a feel for the squeegee, but you can see these are still totally a success. I had the expectation that my first go around would be awful, so I was SO happy that I considered both of these totally wearable. You do want to wash your frame right away, because the paint starts to dry fairly quickly. I immediately applied my second deisgn and went in for round two. Leave the shirts to dry-- it doesn't take all that long. I came back after an episode of The Path and they were good to go. I used my heat press on them for 20 seconds at 320 degrees. You can also use an iron, or even turn them inside out and put them in the dryer. However you do it, you want to apply some heat so that the paint can set. This one didn't turn out as good, but it still worked out. I was seriously all kinds of stoked. Did you try it? Let me know how it goes!